Morrisville State College senior Catherine Howland (on left) poses with Mustangs western coach Dodie Howard prior to competing in the rail phase of the individual AQHA trophy division. It was Howland's third time competing in the division in four seasons and she would receive her highest placing in the class to date. RALEIGH, NC - Though for many years Campus Equestrian has referred to the class as the individual AQHA Trophy division, the IHSA itself lists the division in the annual National show program as the "AQHA High Point Western Rider" division. The American Quarter Horse Association or AQHA has sponsored the division since the 1980's. While the hunter seat equivelent receives the Cacchione Cup the AQHA champion receives two items, one resembling a pitcher and another with a metalic horse on the top. So how exactly does one qualify to compete at Nationals in the AQHA High Point Western Rider division? The IHSA is divided into 36 geographic regions, of which most but not all offer both western in addition to hunter seat. In some cases two hunter seat regions ride as one for western. As a result there were 24 western regions within the IHSA for the 2011-12 season. In each of these regions the rider with the most combined open reining and rail points automatically advances to IHSA Nationals to compete for the AQHA high point western rider. If there is a tie at the end of the regular season then there is a ride-off at Regionals to break this tie and send one rider to Nationals. During the 2011-12 season this took place in Zone 4, Region 3 (which itself is really a combination of Zone 4, Region 3 and Zone 5, Region 4 schools which have western teams). Shannon Leggett of St. Andrews University and Blair Childress of North Carolina State University both finished with 83 points. 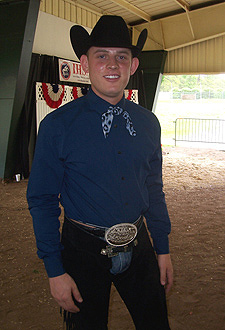 Leggett, a senior from Charles City, Louisiana with several prior appearances at IHSA Nationals, won the ride-off to join 23 other riders at Nationals. The field of riders qualified for the individual AQHA included three riders who were competing for the trophy (or trophies) a third time. Britta Jackson, a University of Louisville senior from Portland, Oregon was out of the ribbons at 2010 and 2011 IHSA Nationals, each of which took place at the Kentucky Horse Park in Lexington, Kentucky. Catherine Howland, a Morrisville State College senior from Rutland, Vermont competed for the prizes in both 2009 Nationals at the Tennessee Miller Coliseum in Murfreesboro, Tennessee and 2011 Nationals. Howland was tenth in the division in Lexington. 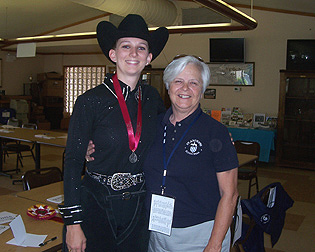 Elizabeth Whitman of Oregon State University had competed at each of the previous three National events but not in the individual AQHA class until 2010. The senior from Albany, Oregon was out of the ribbons in '10 but fifth in the individual AQHA in '11. University of Nebraska at Lincoln senior Hali Jorgensen (pictured) had the third-best rail score and went on to place ninth. Like Whitman and Howland, Austin Griffith of Ohio State had made the top ten at 2011 Nationals and was back again. The sophomore from Dublin, Ohio was third in 2011. Kaycee Reimer of Redlands Community College (a sophomore, from Lookeba, Oklahoma) was out the ribbons in '11 while Kayla Swartz of Bloomsburg University (senior, from Ringtown, Pennsylvania) was out of the ribbons when competing at 2010 Nationals. Swartz was the only rider to have competed in the individual AQHA class in 2010 and 2012 but not in between. Everyone else entered at the Hunt Horse Complex in Raleigh was making their individual AQHA Trophy division debut. Kalcy O'Keefe of Alfred University survived one of the more unusual races. The senior from Rochester, New York technically finished tied at 69-all with teammate Kristin Eklin. However Eklin had built up a big lead before going abroad for the the spring semester. Eklin was still abroad when Regionals took place so O'Keefe automatically advanced. However Justine Barnett of similarly-named Alfred State College scored 68 while Justine Gentilini of Cornell University finished with 67 to make Zone 2, Region 1 the only region where four riders were separated by three points. Alekz Huttemann-Kall of the State University of New York at Oswego (senior, from Watertown, New York) represented nearby Zone 2, Region 2, having edged out Christine Petrone of Cazenovia College by a 64-60 margin for the honor. Ashley Clayton (senior, Sarasota, Florida) was the second University of South Florida rider to qualify for Nationals in the division in as many seasons while the same could be said for Utah State University's Kelsey Romney. Known as Kelsey Wilson at 2011 Nationals, Romney married 2011 Utah State graduate Jason Romney between the two IHSA National shows. Thus the senior from Salt Lake City, Utah is the first rider ever to marry someone and then compete in the same division her husband was entered in at the previous Nationals! There were more seniors entered (14) than the other three classes combined. Others who would compete in only one AQHA High Point Western Rider competition included Brooke Pence of Purdue University (from Danville, Indiana). Like Leggett, Pence had to win a ride-off at Zone 7, Region 1 Regionals to secure a trip to Raleigh. Pence won a ride-off with Doug Mohr of Ball State after both finished with 72 points (Logan Wheeler of Ball State was close with 69 points). Shannon Voges of North Dakota State (from Courtland, Minnesota) had one of the wider margins of any of the seniors. Voges captured Zone 7, Region 3 high point honors by a 68-59 margin over Kerry Hansen of the University of Minnesota - Twin Cities. Krista McNaughton of Arizona State won by nearly as much. The Tucson, Arizona product finished ahead of Cal Poly - Pomona's Laura Thomas by 101-93 to represent Zone 8, Region 2. Hali Jorgensen (from Omaha, Nebraska) won out in Zone 8, Region 5 by 72-67 over University of Nebraska at Lincoln teammate Kallie Kayton. And Jarrod Bush of the University of Findlay scored a significant 105-79 win over teammate Bekah Irish to represent Zone 6, Region 1. It was significant in that the Millersport, Ohio resident kept the 2011 AQHA Champion from repeating as Irish won the competition while still a sophomore at Black Hawk College. University of Findlay senior Jarrod Bush (pictured) had the top rail score and went on to place fourth. Other non-seniors were Brooke Wodrig of Mount Holyoke College (junior, Benton, Pennsylvania), who was a healthy 75-64 winner over Amanda Golembeski of UMass-Amherst in Zone 1, Region 3; Ethan Wilborn of Murray State University (junior, Collinsville, Florida), who finished ten points ahead of Alina Carter of MTSU in Zone 5, Region 1; Caitlin Arthur of Saginaw Valley State University (sophomore, Midland, Michigan), who outscored Michigan State's Sami Jo Stechschulte by two points and Stechschulte's teammate Marley Martin by five for the top spot in Zone 6, Region 4 while also becoming the first-ever SVSU rider to compete at Nationals for the AQHA; Caitlin Fike of College of the Sequoias (sophomore, Hanford, California), who won out over Mia Mendola of Cal Poly - San Luis Obispo in Zone 8, Region 1 by a 68-60 margin; Jen deBernard of the University of Delaware (sophomore, Camden, Delaware), who won the combined Zone 3, Region 2/Zone 4, Region 4 by a 111-105 margin over Jen Taylor of Arcadia University (the highest point total for both a region champion and runner-up in any of the 24 AQHA races around the country that we know of - Editor); Andrea Smith of Berry College (sophomore, Douglasville, Georgia), who prevailed by a 91-80 margin over teammate Amanda Bellamy for the Zone 5, Region 2 spot occupied by former teammate and new Berry Assistant Coach Allie Jones for the past four seasons; Carrie Somerville of Black Hawk College (Onslow, Iowa), the Zone 7, Region 5 champion by a 98-78 margin over teammate Josh Clevenger and the only freshman in the division at Nationals; and Kelsey Delaplaine of West Virginia University. A junior from Gettysburg, Pennsylvania Delaplaine finished on top in Zone 6, Region 5 from which we do not have the year-end totals as of 6/11/12. The Rail Phase of the AQHA High Point Western Rider took place in afternoon on Friday, May 4th. Half of the riders were entered in Section A and the other half in Section B (coincidentally riders in the Cacchione Cup hunter seat high point rider competition competed in two separate sections of the flat phase on either side of Section A). Riders in each section were asked to walk, jog and lope for a certain amount of time before judges Gretchen Mathes and Betsy Tuckey requested everyone line up and perform the pattern one rider at a time. After all 12 riders in each section had completed the pattern announcer Kenn Marash excused everyone. At some point between the end of the day on Friday and the start of the day on Sunday the scores for each rider in the AQHA High Point Western rail phase would be posted in the vicinity of the draw table, as this was where all results were posted throughout the weekend. Because the AQHA sponsors the division, and because the AQHA has a specific scoring system the combined Judge's scores are re-configured to match the AQHA system. The top score received in either phase is converted to "120." The rider who came in second would have "105," third "91," fourth "78," fifth "66," sixth "55," seventh "45," eighth "36," ninth "28," tenth "21," eleventh "15," twelfth "10," thirteenth "6," fourteenth "3," and fifteenth "1." Riders who placed sixteenth or below receive a "0" score for a given phase. However these riders actually received a 'score' prior to determining first through twenty-fourth. By contrast the traditional judge's scores for the Reining Phase would be announced as each rider left the ring. Prior to the start of the Reining Phase (or Reining Classes, as the division is also divided into two sections of 12 riders each) the rail phase scores showed Bush with lead at '120' while Griffith was second at '105' allowing Ohio programs to claim the current top two. UNL's Jorgensen was third, North Dakota State's Voges fourth and Morrisville's Howland fifth. Nine riders had zero scores but five of them would make the top 15 over the course of two reining sections. St. Andrews University senior Shannon Leggett (on left) poses with St. Andrews Director of Riding Peggy McElveen after earning Reserve Champion honors in the AQHA Open Rider division in what was her final undergraduate ride for the Knights. Though St. Andrews had a rider in the individual AQHA on four prior occasions Leggett is their first rider to make the top ten in the division. Section A of the Reining Phase was the second of nine classes held during the Sunday session, the final day of 2012 IHSA Nationals. Until 2011 all of the individual AQHA qualifiers would rein in one lengthy class, with a drag of the ring taking place in the middle. With the new set-up one group of 12 riders goes four classes before the other, and the ring is dragged after six rides in each. Section A of the reining phase contained the exact same riders as section A of the rail phase (these riders were Arthur, Clayton, Delaplaine, Griffith, Huttemann-Kall, Jorgensen, McNaughton, Pence, Romney, Somerville, Voges and Wilborn). The Reining Pattern itself required riders to add an extra quarter of a spin in one direction at the start of the pattern. One by one each rider completed the pattern, with Griffith's announced score of '146' the high score in section A. Also into the 140's was Wilborn, whose '143.5' was a vast improvement over 14th place through the rail phase. Delaplaine earned a '139.5' to offset having finished out of the top 15 two days earlier. Clayton had been tenth through the rail but her score of '138' had a chance to bring her up in the standings based on what happened in the second section. Also into the 130's were Pence ('136.5'), McNaughton ('133'), Voges ('132.5') and Somerville ('130.5'). Huttemann-Kall received a '129,' Arthur a '121' and both Romney and Jorgensen a '0.' Remarkably history will bear out that Jorgensen was still a good bet to be well into the top ten overall based on being in third place through the rail phase. Section B was the sixth class of the day. Once again two riders were in the 140's though neither scored as high as Griffith or Wilborn. Leggett was best in section B, receiving a combined '143' score from Mathes and Tuckey. Whitman's '141' was the fourth-best score across two reining sections, and combined with the eighth best rail score the Oregon State senior was a lock for the top ten. Howland was the best of six section B riders to score within the 130's, earning a '139.' Though this was Howland's final undergraduate ride at an IHSA show she had in fact already extended her season into July! Howland was the only AQHA Trophy rider to coincidentally place inside the top four in the individual open reining division on May 5th. By placing third (with a similar score of '139.5') Howland joined Ohio State's Beth Bianco (the champion), Black Hawk's Clevenger (the reserve champion) and Tobie Montelbano of Texas Tech at the Derby in Oklahoma City. The National Reining Horse Association (NRHA) invites the top four IHSA riders in that division and the top four NCEA/Varsity riders and yet four other at-large selections to compete in their 'Collegiate Derby' division every summer. Others into the 130's were Fike ('138'), Reimer (also a '138'), O'Keefe ('136'), Jackson ('130.5') and deBernard ('130'). Smith received a '127,' Swartz a '126' and Wodrig a '0.' Bush could not duplicate his earlier success on the rail, earning a score of '118.5' to secure a combined score of '120' across two phases using the AQHA scoring system. Would this keep Bush within the top five? Marash invited all 24 riders back to the ring for the presentation of the AQHA High Point Western Rider awards. Several of the 'honorable mentions' from section A were not present when their names were announced though most were. After the 14 riders who were not within the top ten had been announced and had left the ring (Huttemann-Kall, bolstered by the seventh-best rail score, was technically eleventh) Marash read aloud the riders who placed tenth through first in that order. Tenth place went to Clayton, the second rider in University of South Florida program history to compete at IHSA Nationals after Ciara Henderson, who would have technically been eighteenth in the division one year earlier. Clayton had been ninth in the reining phase to go with tenth place in the rail. Ninth place went to Delaplaine, who had the fifth best reining score. Delaplaine was one of only three non-seniors to make the top ten, giving her a chance to improve on her 2012 performance should she qualify for Nationals next season to be held at the Pennsylvania Farm Show Complex in Harrisburg. The fourth best rail score combined with the thirteenth best reining score put Voges into eighth place. Voges was the only Zone 7 rider to make the top ten as it turned out. Though she was one of seven seniors within the top ten Jorgensen was not done for the day. After receiving seventh place Jorgensen was off to prepare for team open western horsemanship later in the day. Thanks to the second-best reining score (to go with the forteenth best rail score) Wilborn was sixth. Wilborn was the final Murray State rider to compete for long-time western coach Don Delaney, who retired due to recent health-related issues. However Delaney was clearly among the happiest people this writer encountered at 2012 Nationals. Ohio State University sophomore Austin Griffith (on horse) poses with many teammates (and his parents, who also happen to coach the Buckeyes) after winning the 2012 AQHA High Point Western Rider championship. Griffith is the fourth rider in Ohio State program history to win the award following Rich Beidelscheis (in 1993), Jill Nicole Soronen (1996) and Laura Phillips (1999). Griffith showed in four classes over the weekend, leaving Raleigh with three firsts and a second! The busiest of all the western riders was Whitman, who competed in both western team classes, both western individual classes and the individual AQHA. Like Jorgensen, Whitman was still to ride in team open western horsemanship (where both riders were on the only teams with a shot at the National Championship). 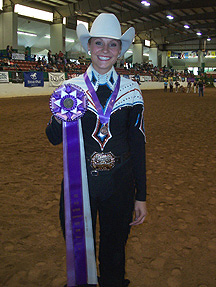 For the moment Whitman was fifth to repeat the exact same ribbon she earned in the division at 2011 Nationals. Bush had watched teammate Katie Morehead compete for the individual AQHA each of the past three seasons (Morehead won the AQHA in 2008 when Bush was a senior in high school). This time it was his turn. Thanks to the top rail score Bush was fourth, giving Findlay the unique distinction of having riders make the top six over the past five seasons without ever repeating the same ribbon! (Findlay riders have faired as well as anyone in this division over the past decade, with Andrew Standaert's eighth in '04 and Morehead's sixth in '11 the only ribbons below fourth place in that span.) Howland's fifth on the rail and sixth in reining combined to give her third place in her third individual AQHA appearance. This was a marked improvement from her previous best of tenth place last season. In previous IHSA Nationals rides Leggett had received a sixth in team novice western (in 2009), a sixth in individual novice western (in 2010), a fifth in team open western horsemanship (two days earlier) and a seventh in the NRHA-sponsored individual open reining (one day earlier). Leggett went out with her best ribbon to date, earning the Reserve Championship in the AQHA high point thanks to a third in the reining phase to go with a sixth in the rail phase. With Leggett exiting the ring only one rider remained. Considering he had the top score in the reining phase after having finished second in the rail virtually everyone who followed the division from start to finish was not suprised to see Austin Griffith receive the 2012 individual AQHA awards. Many who have followed the IHSA over a considerable number of years are aware that Griffith is the son of Ohio State coaches Ollie and Debbie Griffith, who themselves have coached the Buckeyes to nine IHSA National titles and who had three prior individual AQHA champions. When Austin Griffith started riding - and winning - in the IHSA during the fall of 2010 some felt it was only a matter of time before he would fair well in the open classes at Nationals. It turned out that the only sophomore to finish in the top ten of the AQHA high point western was also the overall winner among western riders at 2012 Nationals. Griffith won both team open western horsemanship and team open reining while placing second in individual open western horsemanship to go along with being the top western open rider. Because Griffith has been associated with the IHSA even as a toddler this writer decided to ask what his earliest IHSA memories are. Griffith recalled being photographed at 1996 Nationals in Burbank with the entire Ohio State team (which had just won their fourth-ever National Championship). While Griffith estimates he was only six at that time he has a better memory of 2003 Nationals or at least what happened afterwards. Like many who were in the Nashville area overnight following the final day of 2003 Nationals few will forget the tornado warnings which forced everyone from their hotel rooms at 2:30AM in the morning to the center of the hotel. While the Tornados did not touch down in the immediate area there was a tremendous hailstorm which left dents in most cars (including this writer's). While Griffith has ridden with several people he sites his parents as his only 'trainers.' Griffith had placed third at 2011 Nationals in his individual AQHA debut and followed it up with a first this time. What could Griffith do for an encore? The team just missed out on the National Championship, falling 24-22 to Oregon State in spite of two firsts for Griffith. Perhaps he can be part of the tenth Ohio State National Champion team if things fall into place for the Buckeyes. Listed below are the placings from the 2012 IHSA Nationals Individual AQHA Trophy class. The Rail phase (which was actually two separate sections made up of twelve riders each) took place on Friday, May 4th while the Reining Phase (again, two separate sections made up of twelve riders each) took place on Sunday, May 6th. Rails scores are listed first while the Reining scores and combined scores of each rider follow. 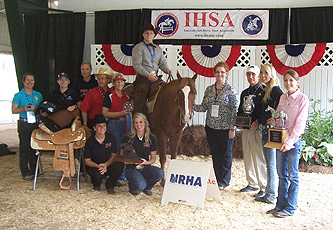 The judges for all Western divisions held during 2012 IHSA Nationals May 4th through 6th were Gretchen Mathes and Betsy Tuckey. 2012 IHSA Nationals were held at the James B. Hunt Horse Complex in Raleigh, North Carolina.